Sydney is bold and brash and self-assured, a thriving city that is at once cosmopolitan and laid-back. It is defined as much by its man-made sights as its natural wonders. An ideal day in Sydney starts with a brisk walk, usually along a coastal headland track or beach, followed by coffee and breakfast at a local cafe; try leafy suburbs like Potts Point and Woollahra or inner-city Surry Hills to be spoiled for choice in this respect. 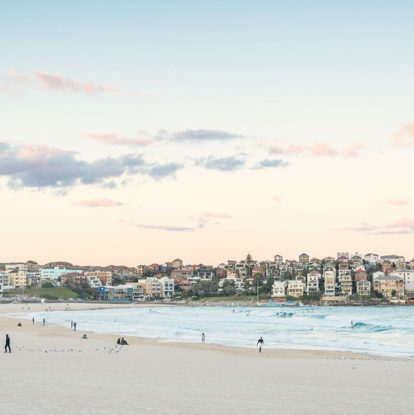 After passing the day seeing the sights concentrated around Sydney Harbour and doing a spot of boutique shopping in neighborhoods like Newtown, Darlinghurst and Mosman, end the day as you started, with a sunset walk in Bondi or Manly followed by dinner and drinks. Choose from a variety of excellent restaurants at Sydney’s Tramsheds. The Merivale Group is a Sydney hospitality institution with numerous restaurants and bars across the city; head to the cozy and relaxed Fred’s in Paddington for a menu of sustainable produce that changes daily, or get caught up in the lunchtime dim sum buzz at Mr Wong in the city center. Another company doing lovely things with food and decor is the Boathouse Group, whose airy beachside cafes are the epitome of Sydney style. And in Glebe, 10 minutes from the city center, Tramsheds is a lively restaurant hub housed in a formerly derelict tramshed. The last tram to roll out of the yard is now a dining space in one of the restaurants. Veriu broadway is close to shopping, parks and great eats, with sleek and spacious loft rooms. Located in the historic Rocks neighborhood, the Langham Sydney has pretty, light-filled rooms and stunning views. Its afternoon high tea is a treat. With its harborside position and jaw-dropping view of the Opera House and Harbour Bridge, Park Hyatt Sydney is next-level luxury. Arrive at the renowned Berowra Waters Inn for its degustation menu by air with Sydney Seaplanes, landing on the bush-fringed river it overlooks. Sydneysiders love their fresh seafood, and one of their favorite places to buy and eat it is the Sydney Fish Market, in the inner-city suburb of Pyrmont. For the ultimate experience book a class at the Sydney Seafood School, to create dishes using market-fresh sea-food in its state-of-the-art kitchen before sitting down to dine looking out to 360-degree views of lovely Blackwattle Bay. The most popular class is the Seafood BBQ, because Sydneysiders love their barbecue too. Cruise Sydney Harbour on your own private yacht, taking in the sights during a two-hour twilight cruise before being moored for the night in secluded Taylors Bay, complete with a picnic hamper. Fall asleep to the gentle sway of the boat, waking in the morning to breakfast and coffee on deck. The sun-kissed beach suburbs to the north of the city offer a breezy pace of life that’s the envy of other Sydneysiders. Life in the Northern Beaches revolves around the water. At Palm Beach, 28 miles from the city, learn to surf, go hiking to Barrenjoey Lighthouse, kayaking around tranquil Pittwater and watch for humpback whales. In Clareville there are stylish interiors decor stores filled with designs suited to the luxury houses in the area. Take a walk up to Barrenjoey lighthouse and enjoy the views. Jonah’s in Whale Beach has rooms looking out to stunning water views. Any stay should include lunch or dinner in the award-winning restaurant. Barrenjoey House serves up modern Australian dishes with Mediterranean influences. A 1.5-hour drive from the city, the Blue Mountains are made up of imposing escarpments, seemingly endless tracks of national park and quaint mountain villages. Spending time in the mountains is all about being in nature. Head to the Three Sisters, a rock formation of three pillars with an Indigenous back story. The nearby Scenic railway is the steepest passenger railway in the world; ride it down into the Jamison Valley where you can take the 1.5-mile walk through ancient Jurassic rainforest. The landmark Hydro Majestic Hotel Blue Mountains is the obvious choice for its history and grand style. The award-winning Darley’s is charming and cozy. The rolling countryside of this popular locals’ getaway, just over an hour from Sydney, is home to a collection of quaint towns and villages to explore. Head to Bowral, with its pretty historic houses and bustling main street; drop into Dirty Janes Emporium to browse vintage fashions and furniture, and grab a hot coconut chocolate at The Press Cafe, which shares space with a vintage letterpress. Every September the Tulip Festival sees Corbett Gardens planted with 100,000 bulbs. In Moss Vale, the main street is busy with boutiques selling local crafts, while the historic village of Berrima feels like stepping back in time to a bygone era with its heritage buildings. The area also boasts a number of wineries, many with tasting rooms to sample the cold climate varieties. Gibraltar Hotel Bowral combines a luxury boutique hotel, day spa and an 18-hole golf course. Biota Dining’s tasting menu and share plates make the most of locally sourced produce and wines. Find your home away from home with a visit to award-winning Fred’s. Head chef Danielle Alvarez, who earned her stripes at Chez Panisse, has built her menu around sustainable produce and seasonality. Discover the beauty of summer in Sydney with show-stopping views of the Sydney Opera House at our harborside hotel. Includes overnight luxury accommodation with full breakfast for two and private balcony with views of Sydney Harbour. Discover the beautiful surroundings of Jonah’s Whale Beach with a luxurious overnight stay, sailing adventure, and indulgent dining.